Ground coffee in hot water. It’s a simple concept, but the world wouldn’t be the same without it. Even if you’re not a coffee drinker, it’s hard to underestimate the impact of the little caffeinated bean that could. While many different brewing methods have evolved, perhaps there is none better than the simplest one: ground coffee in hot water. Yes, it’s worth repeating: ground coffee in hot water. Using a press pot brings this method to the table. Literally. Just add grounds and hot water and let it steep. How long is entirely up to the coffee drinker and makes for unparalleled control over the resulting brew. 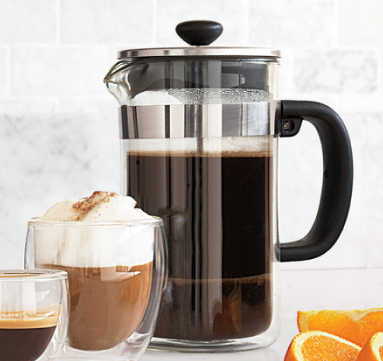 For less than $50, the Bodum Double-Walled French Press offers an excellent option for home brewing. Featuring double-walled construction, the tempered glass offers not only a time-tested way to brew your brew, but also a way to keep it warm at the table.